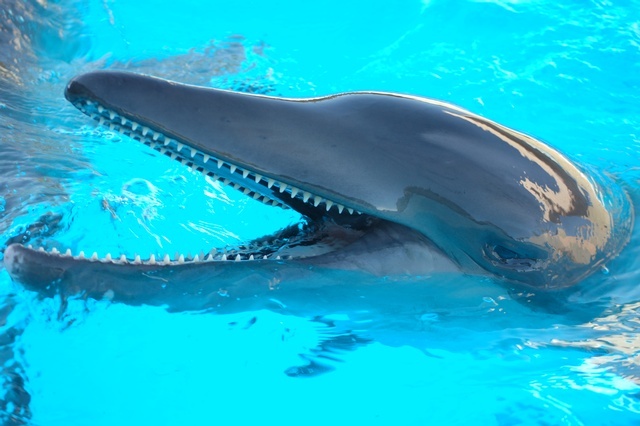 Doris, a female rough-toothed dolphin (Steno bredanensis) was rescued at the same time as Ivan, shortly after Hurricane Ivan in 2004. The mass stranding of 5 animals occurred on Cape San Blas, FL, near St. Joe Peninsula State Park. All five made it safely to Gulf World, however only 3 survived. Doris was deemed non-releasable by the National Marine Fisheries Service (NOAA). Gulf World is now her permanent home. Doris has a branded ‘7’ on her dorsal fin and small hole in tail fluke that is used to identify her.